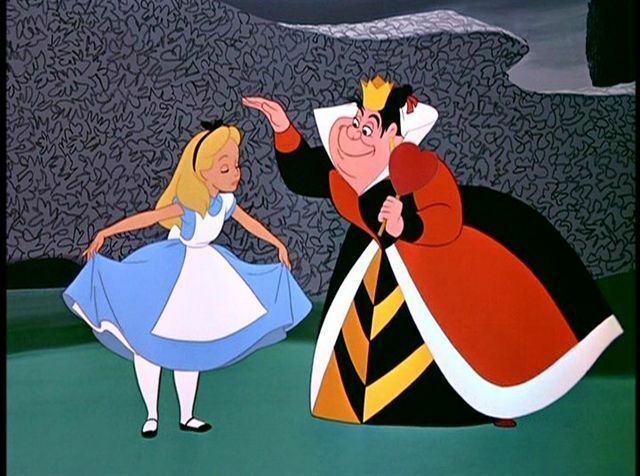 Alice In Wonderland: Reject All Inferior Imitations! This is the Real Deal! Walt, a promising young graphics artist, was struggling. His animation business in Kansas City just wasn't making it. He tried everything he could think of with short cartoons, but the public just didn't like them. Times were tough, but he wasn't choosy - live action or animation, it didn't matter, he just needed to eat. He gave it one last try, using an unknown local child who had been useful on some of his earlier shoots, Virginia Davis. 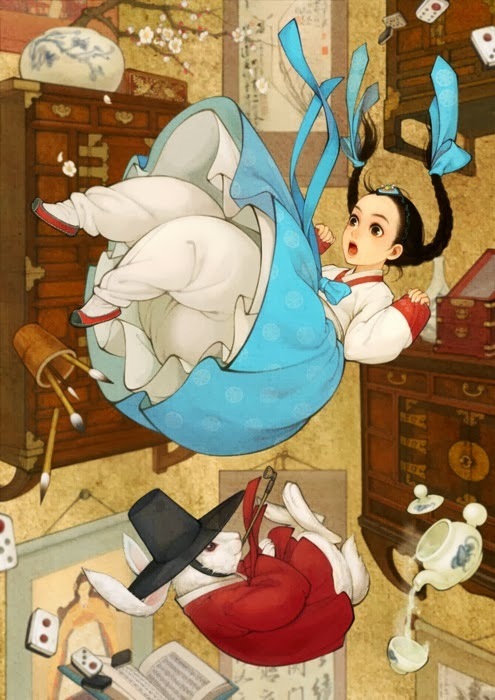 The last-ditch project would be a combination of live action and animation based on English author Lewis Carroll's "Alice in Wonderland." He filmed it and was pleased: excellent work, if he did say so himself. The White Rabbit. Jefferson Airplane must have loved this film. Discouraged, Walt gave it all up and headed to Hollywood, desperate enough to give up animation completely and just try to become a regular film director. He knew this would work, it was his ticket to the Promised Land: a film job. Walt banged on doors, he begged, he pleaded: just hire me. I will direct anything. Nobody hired him. Walt became desperate. 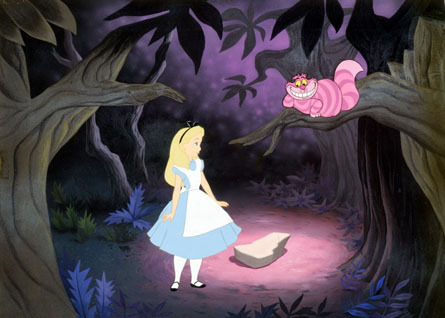 Alice talking to Cheshire Cat. "I prefer the short-cut." 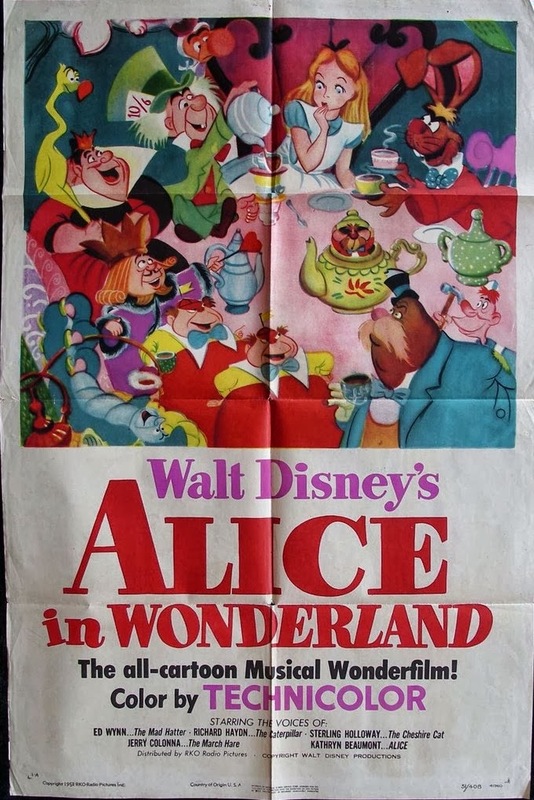 His older brother Roy believed in Walt, so together they scrounged up some cash, opened shop with the pretentious title "Disney Brothers Studio," and pulled the old "Alice" reel out of Walt's trunk. They showed it to M. J. Winkler, a local distributor. You may have noticed, I'm not all there! Elated, the brothers called all their old animation buddies from Kansas City and told them to head west. There was work in Hollywood! They wouldn't have to do anything that they hadn't been doing all along, somebody finally appreciated their work. They packed up and joined Walt. 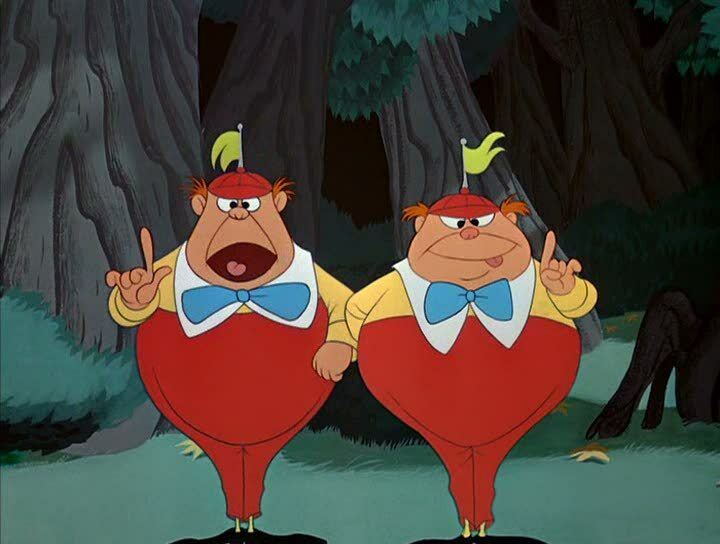 Over the next few years, the brothers and their friends put together over 50 silent shorts they called "Alice Comedies." Later, Walt came up with the idea of a talking mouse who did crazy things, and the public loved it. Aren't those the bluest eyes? Walt's success grew, and soon he was one of the biggest movers and shakers in the film industry. 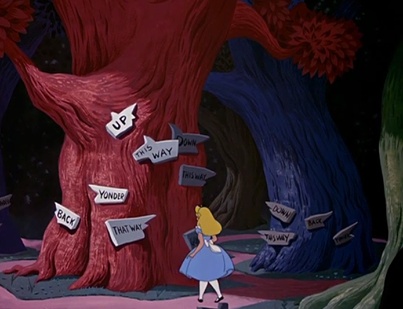 "Alice in Wonderland," though, stayed on his mind. It was practically his baby: he knew it inside and out, knew just how to film it, and had the people in place with the experience to do it. it was a sure thing, like drawing to an inside straight. But he was being tugged every which way by what was going on in Hollywood at the time. He almost got it going in 1933, actually doing a screen test with star Mary Pickford, but then his biggest nightmare happened: Paramount did a live-action version starring the biggest stars of the day, including Gary Cooper, Cary Grant and W.C. Fields. Trying to put on his own little animated feature featuring unknowns in the face of all that talent would be sheer poison. Walt reluctantly turned to other projects. After the boys in the back room gave him a hit with Snow White and the Seven Dwarfs, he felt the time was right. Once he finished off a few more pictures already in the pipeline, it would be ready to go. He even had the name registered - all he needed was a year to put behind it. 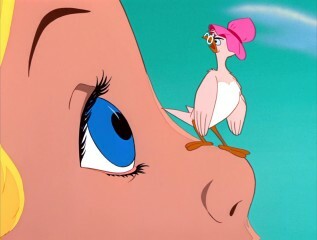 But Pinocchio, Fantasia and Bambi all bombed, and while Dumbo succeeded, it didn't give him much breathing room for long. What to do? Which way to go? Walt was lost, and the way ahead was unclear. Worse, World War II had broken out. European and Asian markets were shut down for the duration. Walt was forced to turn his focus to smaller projects and bide his time until he could justify larger projects which depended upon foreign revenues. Times are tough. 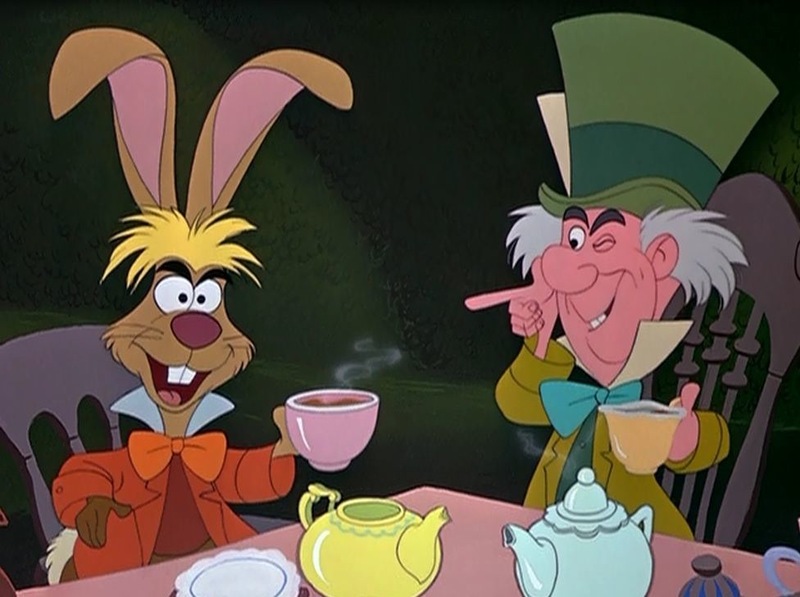 One lump, or two? The war finally ended, and Walt excitedly came back to the Alice project, as he liked to call it. Ginger Rogers was available, and it wasn't often he got to work with an Oscar-winning actress, but animation took time, and she had to move on to other projects. His people brought him proposals, but he turned them all down. This was his baby, and it was going to be special. 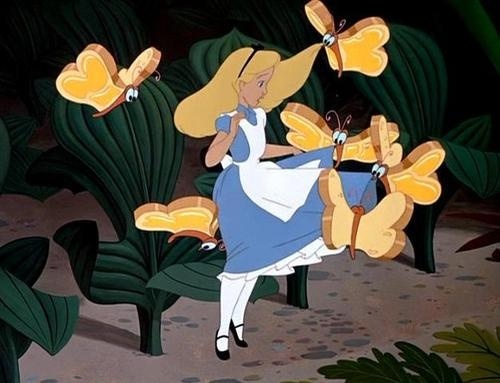 No, Alice! Don't go through there! Finally, Walt ran out of patience, as he wasn't getting any younger. He told his people to just do it. Rather than get cute, he wanted some of his usual reliable directors - Clyde Geronimi, Wilfred Jackson and Hamilton Luke - to play it straight and do it as they did all the other animation features. It was to be all animated, none of this fancy live-action/animation stuff, and heavy on the comedy and upbeat tunes. Once Cinderella was out of the way, it finally was time. 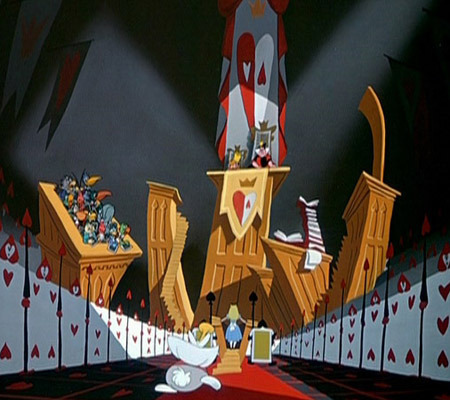 The feature had his steady crew voicing it, including Sterling Holloway as the Cheshire Cat, Verna Felton as the Queen of Hearts, and Bill Thompson as the White Rabbit. 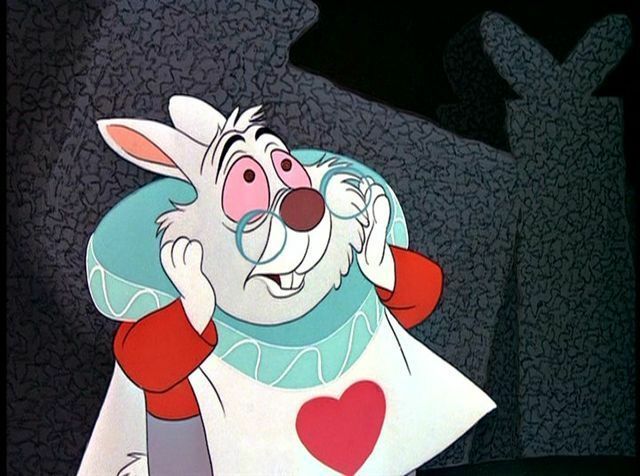 To that stellar foundation of a cast, he had been able to add Ed Wynn, an old-time comic whose son Keenan was a rising star, as the Mad Hatter; famous comedian Jerry Colonna as the March Hare; and cute young unknown Kathryn Beaumont as blue-skirted Alice. Kathryn had just the right upper-class British accent, and surely that would charm the British into making the film a hit there. Not taking any chances, he made sure high quality songs were included in the project. He received more song submissions, in fact, than he could possibly use, and put some aside for the planned "Peter Pan" and other future projects. He skimmed off the cream and indulgently used sprightly tunes for just a few seconds each. Original posters are collectors items - "The all-cartoon Musical Wonderfilm!" Everyone thinks of Walt Disney as this staid, conservative character - which he was in many ways. Very straight-laced, which was completely at odds with many of his employees. 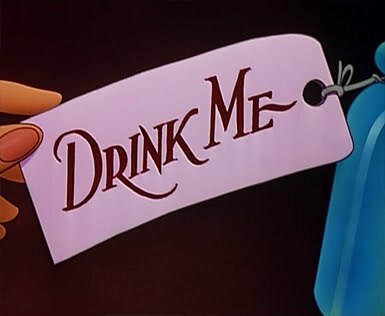 However, in his animation, Walt Disney was as wild and creative as anyone. He was kind of like the quarterback who goes to church and reads the bible each week, but on the field is a daring, inventive scrambler. 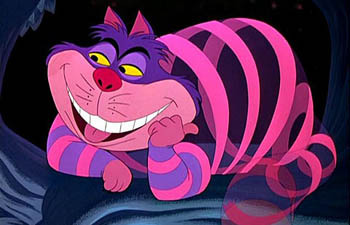 If he had his way, "Alice in Wonderland" would have been even wackier - and likely better. But it was the 1950s, and his advisers were correct: it just wasn't the right time to get all freaky with Alice. The caterpillar. Whooooooo are you? 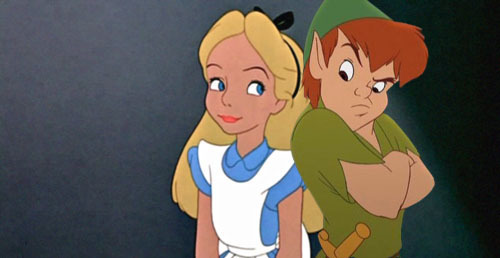 The film's plot did follow the original book fairly closely, though with a few typical Disney alterations. A young girl named Alice daydreams and tells her cat, Dinah, that she is bored with studying and wishes she could live in a different world. She then spots a formally dressed rabbit who runs by claiming to be late for an appointment. She follows him down a rabbit hole and engages in a series of bizarre adventures, always chasing the rabbit but never quite catching up with him. It is a completely different world, as she had desired, but it's not what she had expected at all. 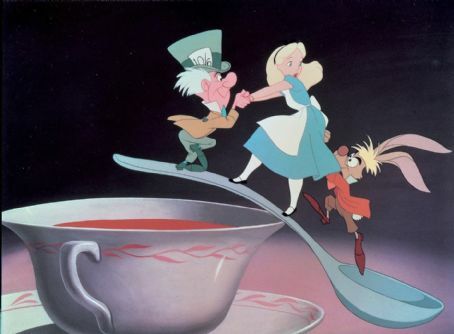 She is surrounded by madness, with a Mad Hatter, a March Hare, and a Dormouse drinking tea of all things. 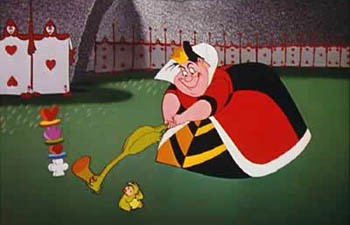 When she tries to run away, she runs into the Queen of Hearts, who puts her on trial and orders her execution. Alice runs away, chased by everyone she has met. Upon release, the critics hated the film, but Walt didn't care. He had made this film for the fans, and he was sure they would love this project over which he had obsessed for over thirty years. He was in for a surprise. The fans didn't really like it. After all he had been though with the project, though, Walt wasn't too surprised. 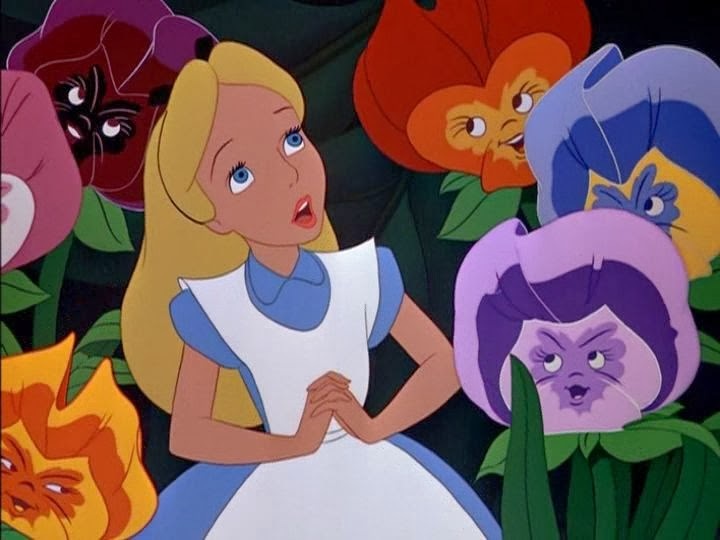 The British in particular claimed he had "Americanized" the sacred text, while others complained that the film seemed disjointed and that the Alice character wasn't sympathetic. Box office receipts were bad, very bad, but fortunately Walt had some cash set aside from the smash success of "Cinderella." Dejected, Walt refused to give up. He recalled that he had a new outlet for his studio, a weekly television show. "Alice" would - after some minor cuts - fit right in there and get bonanza ratings! 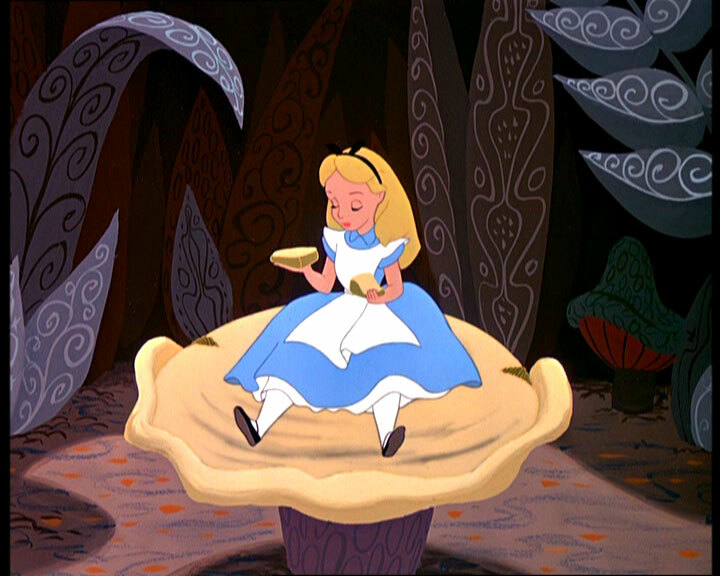 He used "Alice" in the second episode, cut down to match the time slot. Reaction was positive, ratings were good, and it got the new tv series off to a great start. 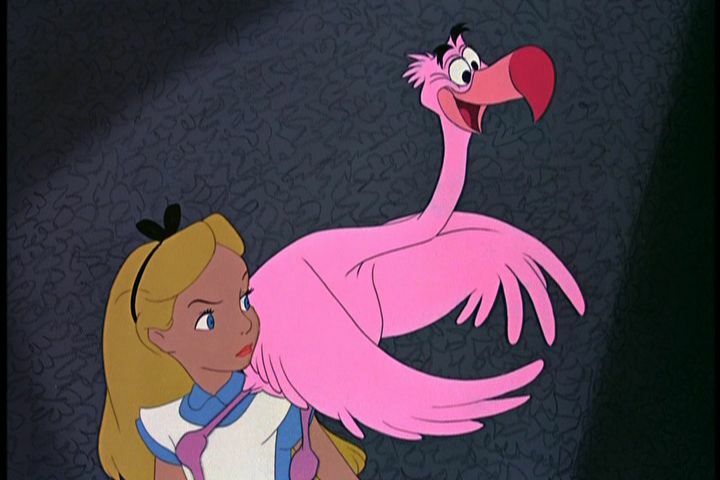 After that, Walt shelved "Alice" until the times changed. He had experience there, as re-releases of earlier animated films - even the duds such as "Pinocchio" - already were turning into a major money-maker for the studio. Quite a court! Notice the cards are all Hearts. Alice on Trial. Times did change, but unfortunately the desperate genius from Kansas City didn't live to see them. 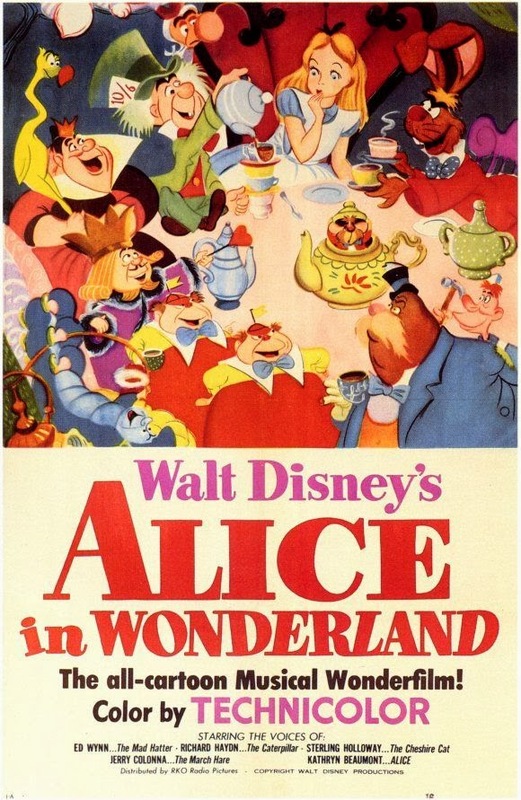 Only a couple of years after Walt Disney had passed away, the world finally caught up with "Alice in Wonderland" (1951). The counter-culture pot-heads and acid freaks of the early '70s loved the twisted and bizarre visuals by Mary Blair, and college campuses around the country started screening it. 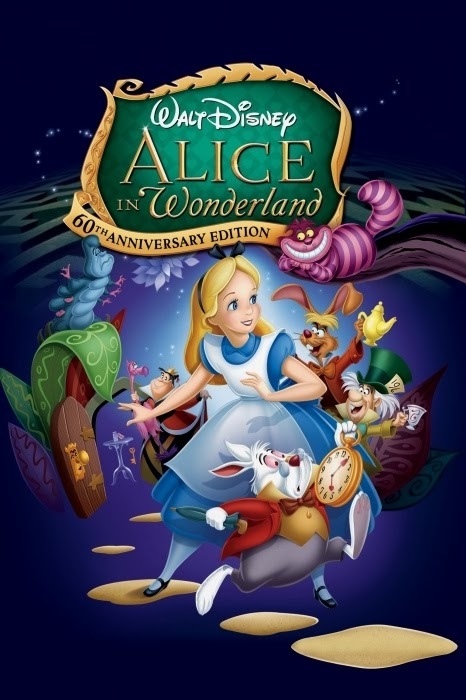 It is simply accepted that such a classic as "Alice in Wonderland" must have been a huge hit from the moment it hit the big screen. It wasn't. But now, it is one of Disney's biggest hits of all. 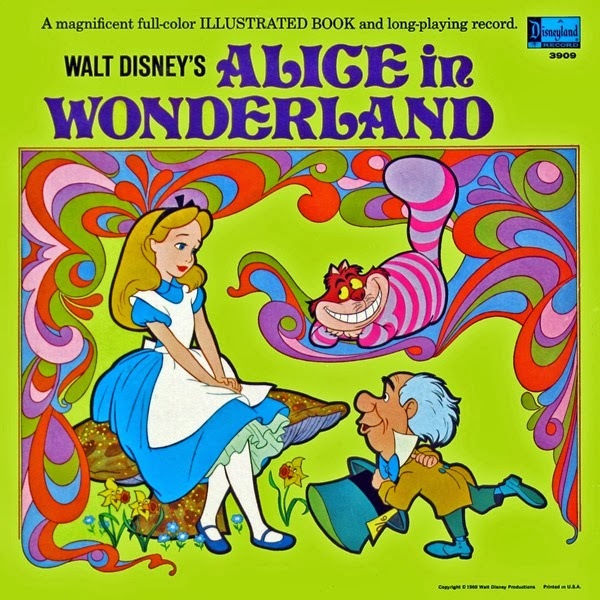 This illustrated book/record release emphasized the psychedelic aspects of "Alice in Wonderland"
Another re-release followed in 1974, which also was successful and led to later releases in theaters and on home video. 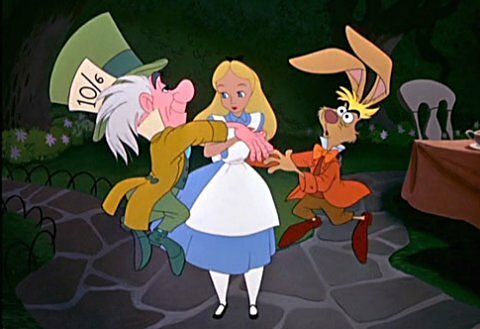 The counterculture movement that had spawned in the 1960s grew steadily in the early '70s and embraced Disney's wild and wacky "Alice in Wonderland." In fact, it became so highly thought of that Disney made it one of the very first titles available for VCR rental in the 1980s. It has been on store shelves ever since. Finally, the picture was making money, good money. And it has ever since. 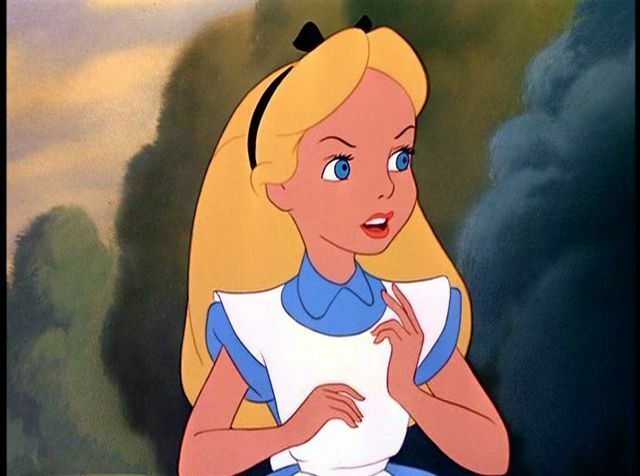 Costumed versions of "Alice" characters are mainstays at all of Disney's theme parks. One of the rides is the "Mad Tea Party," a teacups ride for children. Disney indirectly owns the theatrical rights, and the play is staged regularly at high schools and colleges. Beyonce Knowles posed as Alice for the Disney Portraits series. There's even a video game for Nintendo Game Boy. 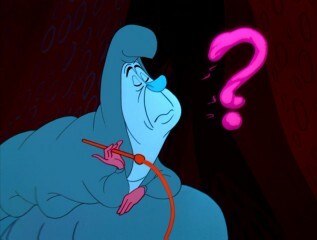 The only thing bigger than Alice these days in the Disney Universe is "Frozen" and the Queen of them all, "Cinderella." 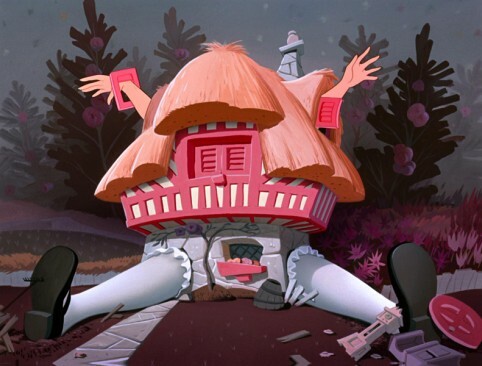 Nobody will ever touch "Cinderella" in terms of popularity, that just cannot be. You can see why the '60s college kids thought this was trippy. Applaud the Queen! 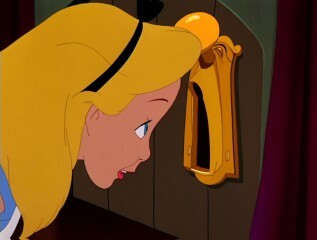 Today, "Alice" is seen as one of Disney's classic films. Its latest release was on February 6, 2011 on Blu-ray to celebrate its 60th anniversary - which Walt tacitly would have crossed out and put down as its 88th anniversary, from the time he put together that first short with Virginia Davis. "Don't worry, Peter, your turn is coming next!" There was a 2010 live-action version with Johnny Depp and Anne Hathaway, and it made a billion dollars - a billion dollars! - but it still didn't touch Disney's animated version in terms of telling the basic, original story the way people want it to be. 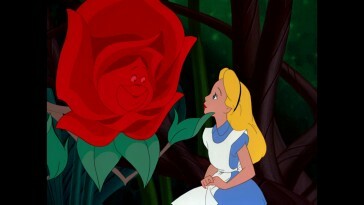 "Alice in Wonderland" may go in and out of style, but if you like classic Disney, you'll love this film. Below are both the original theatrical trailer and the entire film. 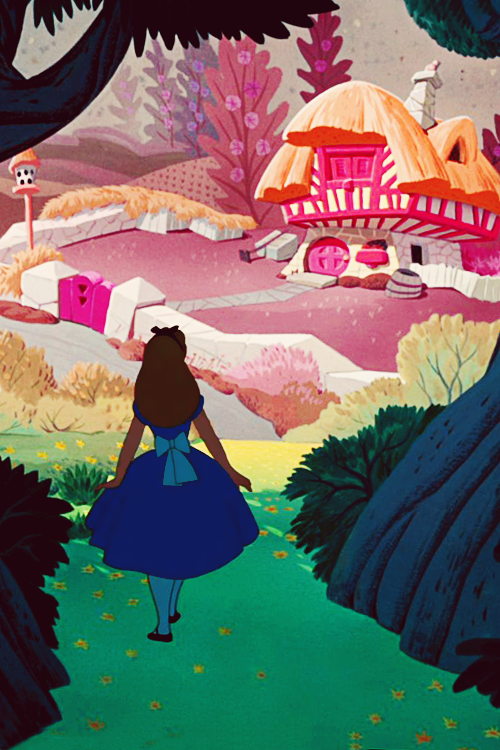 Below is the original trailer from "Alice in Wonderland."